Today's paper doll set is this one. They're Wispy Walker paper dolls. Wispy Walker,by Uneeda, was one of those 'hold my hand and I walk with you' dolls that were almost 3 feet tall. They were around forever,(and Amazon has a Wispy right now, which is supposed to be part of the Uneeda Classic Collction' of repro Uneeda dolls. ),but I didn't realize Wispy Walker was popular enough to warrant it's own paper doll set. These were made by,who else,Whitman,in 1976. There are some cute outfits amongst the very 70's fare. As some of you may know, love sailor suits, so of course,I picked this one to have her try on. There is even a granny dress,which was a popular style of the era. Is the red one a dress or a nightgown though? Eww. I think my sister had those ugly pants! 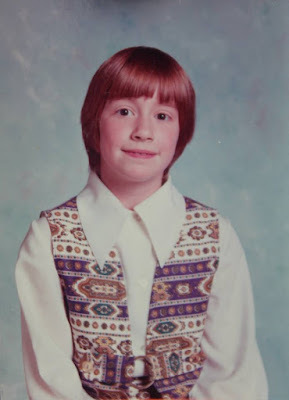 I wore those horrible 70's clothes too as a kid. I don't think I thought much about fashion at the time! From the look of that top outfit, neither did Wispy! See you tomorrow.happy Thanksgiving in case I don't!